In 1927 Ike was interviewed by Carolyn Rhone – owner of the Corner Cupboard. His story is full of adventure in Wyoming and Colorado. Read the Ike Alden story. Perhaps a no more colorful or eventful life was known to local residents than that of Isaac Alden, who was born in Indiana in 1848, dying at the J. K. Mullin home in Denver where he had spent the past five years, on November 8, 1933 at the age of 90. He was buried in the Grand Lake cemetery on November 10, Raymond P. Gregg officiating. Alden’s second trip to Middle Park when he came to stay was in 1880. Prior to that he was a scout in the Indian wars and a hunter and trapper in the Black hills of South Dakota. When coming to Middle Park to live, he entered the Park over Lulu pass about the time that Chief Tabernash of the Utes led in the Indian uprising and in the burning of the forests of Middle Park. 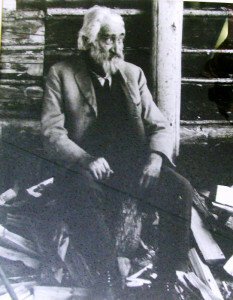 Alden in his life here was primarily a mining prospector, although he spent some time in packing ore for the Wolverine mine in 1883, and at other times engaged in short-lived businesses. On his first visit to this section, prior to 1880, he discovered and located a rich mine south of Gravel mountain in Willow creek valley, but the forest fires caused by the Indians so changed the topographical appearance of the land that the mine was never rediscovered, although Alden spent years, altogether, in the search. Among the outstanding spisodes in the life of Alden was his being within hearing distance of the Custer massacre while he was out hunting meat for a mining camp at Leeds, he was an eye witness of the Grand Lake shooting in 1883 and was the first non-combatant on the ground after the shooting, and he was on the Ute Hunting ground a few hours after the Indian massacre in which Cheyennes and Arapahoes fought the Utes. Alden was a close friend of Chief Colorow of the Utes at that time. Alden was laid to rest in a row of graves of pioneers (his makes the seventh) in the Grand Lake cemetery, within full view of the mountain ranges – Byers peak and Eagle’s Nest range on the south, the Continental divide to the east and Bowen’s peak and Never Summer range to the northward. From the hill north of the cemetery can be seen the water sheds of the Blue, the Williams Fork and the Fraser rivers. Among the seven graves now are Alden’s, Wescott’s, Andy Earhart’s and Chief Gregg’s. This entry was posted in People by Grand Lake Area Historical Society. Bookmark the permalink.